Don plays a cop unjustly accused of sexual assault in this actor-laden episode of the acclaimed POLICE STORY. from UNSUNG HERO "The Making of a Deadly Hero" (3 min) will follow the screening of A HATFUL OF RAIN. Don Murray, Diahn Williams, James Earl Jones, Treat Williams, Conchata Ferrell; directed by Ivan Nagy. (1976, 100 min) Digital. Ed Lacy (Don Murray) has a big problem. The woman whose life he saved (Diahn Williams) during a kidnapping incident has come to doubt his claim that her assailant (James Earl Jones) was armed at the time he was shot. Don dominates the screen as he depicts Lacy's slow, inevitable decline into madness and violence. Come watch and see a cello "played" as you've never seen it before (or since). Don Murray's personal favorite film, THE HOODLUM PRIEST tells the story of Father Charles Dismas Clark, who led the crusade for halfway houses as a mechanism to rehabilitate ex-convicts. Keir Dullea makes an iconic debut as the troubled young man Clark tries to set on the right path, with tragic results. Brilliantly photographed by Haskell Wexler. ► TICKETS for triple feature: POLICE STORY: THE BIG WALK, DEADLY HERO and THE HOODLUM PRIEST. 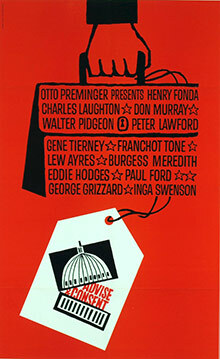 The great political film of the early 60s, with an amazing all-star cast, contains what might be Don Murray's greatest film performance as a young senator from Utah who falls victim to sexual blackmail over a homosexual encounter during a heated confirmation process for a controversial nominee for Secretary of State (Henry Fonda). More than a dozen actors turned down the part—fortunately, indeed, because once watching Murray in the final, tragic throes of the net in which he's caught, it's impossible to imagine anyone else in the role. It's a brilliantly muted performance, the stuff of high tragedy, all of it choreographed masterfully by the great Otto Preminger. Don Murray rocketed to stardom playing naïve, enthusiastic, and war-whoopin' cowboy Bo Decker, who falls in love with a pale chantoozie named Cherie (played by the one and only Marilyn Monroe). Don was nominated for an Oscar as Best Supporting Actor for this performance; it's still a classic nearly sixty years later. 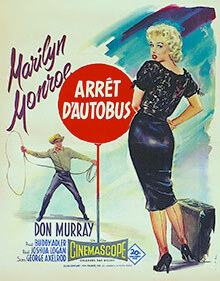 from UNSUNG HERO "Don Murray on Marilyn Monroe" (6 min) will precede the screening of BUS STOP.